A Colorado landlord is caught in a highly-publicized legal squabble with a long-term tenant after its eviction order was overturned. The landlord in this case filed for eviction because the tenant refused to pay a separate charge for water, totaling just over $140.00. However, a local rental law prohibits evicting a tenant over utility bills. Although an eviction judge originally sided with the landlord, that order was overturned by a higher court. Now, the landlord is forced to appeal. This mistake is particularly common with national property management companies where a corporate office supplies all the forms or makes policy decisions. Rental laws are notoriously varied from state to state, so it is crucial that local employees learn the lay of the land before taking legal action. In addition to violating a local law, the landlord in this case is accused of not following the lease agreement. According to a local report, the water charge was never included in the rent, nor was it ever charged to the tenant in the twenty-nine years she resided in the rental home. The judge who overturned the eviction order specifically cited to the law of contracts that provides a lease generally cannot be modified unilaterally, or by simply moving a material provision into the house rules, which can be modified unilaterally. Material terms — anything that involves money owed by the tenant — can be changed only with tenant consent. Not knowing or not checking what is in the original lease agreement is a common problem, especially for investors who buy tenant-occupied rental properties and property management employees who are not familiar with the previously-executed leases. Reading through the lease agreement is a prerequisite to bringing any sort of legal action or any disciplinary action against a tenant. That step alone can save hundreds — or thousands — of dollars in legal fees, court charges, or penalties. 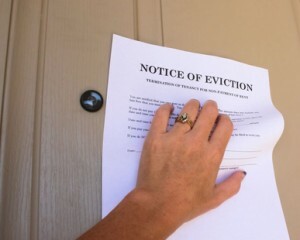 Eviction always should be viewed as a last resort. If it is possible to manage a tenant dispute, that will undoubtedly be the most-cost effective option. Simple lines of communication set the stage for effective dispute resolution. Speaking with tenants, allowing opportunities to air complaints, and being creative with solutions to property management issues can avoid problems like disgruntled tenants, bad press, and negative ratings and reviews that inevitably impact tenant retention and the ability to attract the best tenants.